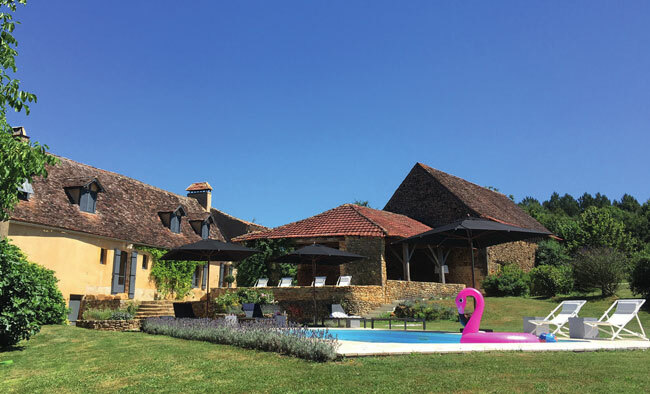 Rupert Springfield and Franck van der Hooft fell in love with the Dordogne one summer, there and then making plans to return and create their perfect home and business. They’ve turned the fantasy into reality! 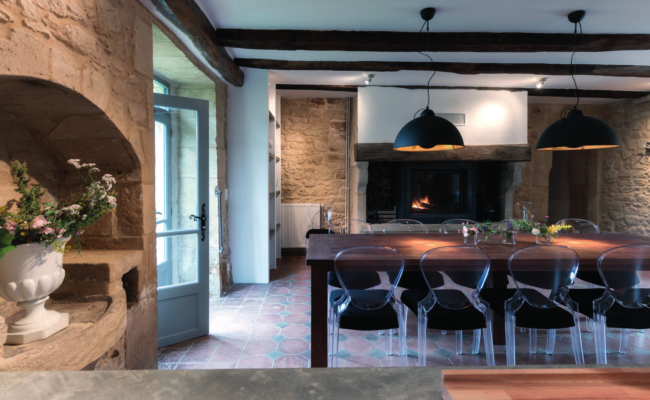 FRENCHENTRÉE MAGAZINE: How did you pick this area? 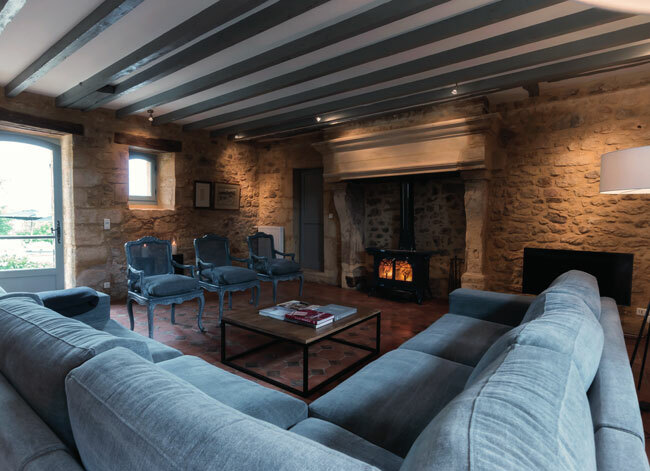 RUPERT SPRINGFIELD: In 2013, my husband Franck and I came on holiday to the Dordogne and were surprised by how affordable properties were here – considering how beautiful the Dordogne is, with its great history, gastronomy, climate and tranquillity. At the time, we were living in a wonderful, but minuscule, 17th-century flat right in the heart of Amsterdam. Franck, who is Dutch, had had a long career as a theatre producer (including producing the first ever European tour of Cirque de Soleil) and I was head of fundraising for the Dutch breast cancer charity. I was approaching 40, tired of living in such a cramped city (I am English, but lived in Amsterdam for 15 years before moving to France) and wanted to take advantage of having no kids and few responsibilities. So we sat down in the garden of the gîte we were renting in Trémolat and I scribbled down some numbers, plucked out of thin air, on the back of an envelope and announced that we could not only afford to buy a property, but could also generate enough income by renting out gîtes to pay our bills. We would be sacrificing good salaries, but also the high costs that come with living in a city. No more big holidays, new suits, or annual parking permits. Two things got us through that early period in which we tried to turn our dream into a serious plan. 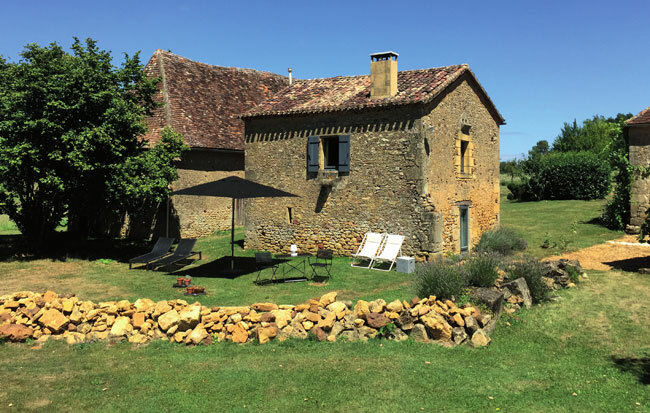 Firstly, we were convinced we could do it, even though we had no idea about running a business in France – let alone a gîte. Without this conviction, we would have given up and still be in Amsterdam. The second thing was the advice and help of others. Very early on, we acknowledged that we were novices, so every time we met anyone who had the experience or knowledge we lacked, we would soak up everything they were willing to share with us. 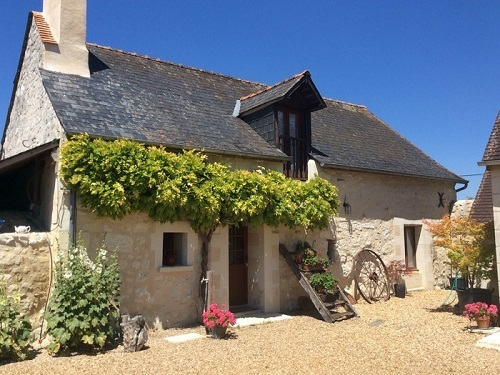 We learnt the differences between running chambres d’hôtes and gîtes, the importance of the proximity of the property to traffic hubs such as airports, as well as the need to define our target group and understand what kind of holiday property they look for. FE: How did you find the property? 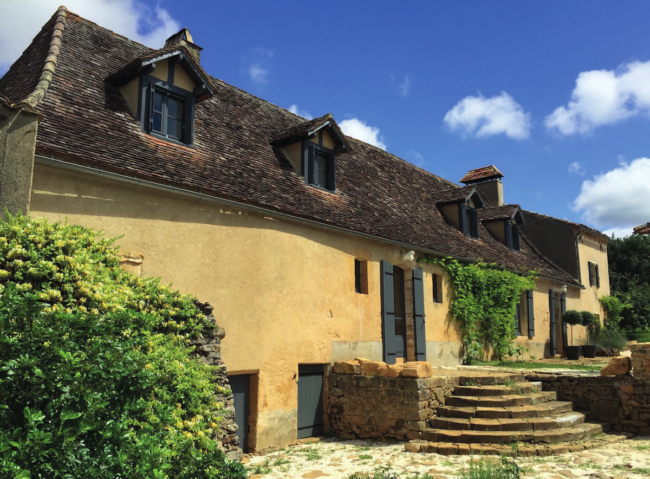 RS: After viewing 70 houses over a two year period, we drove up a winding private lane through a wild wood and open fields to Le Mas, a group of farm buildings perched on a hill overlooking stunning Dordogne countryside. Our hearts beat faster. There was the main farmhouse, lived in by a couple and five dogs, a one-bedroom cottage that was rented out very successfully, and lots of outbuildings – one of which was a barn for drying tobacco, or rather a dumping ground for old farm machinery and ancient beams and doors. 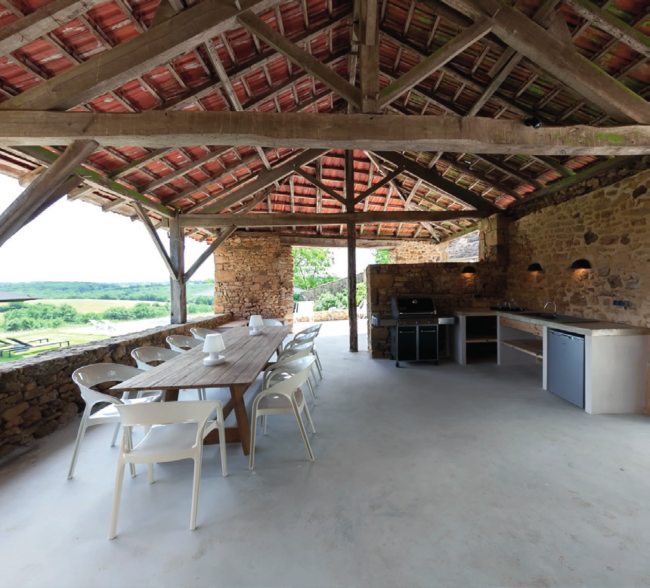 We knew Le Mas was the place for us; we could convert the tobacco barn into an amazing house for ourselves and transform the main house and cottage into gîtes. FE: It was quite an ambitious project. Were you at all daunted by the extent (and cost) of the renovation needed? RS: The question was: could we afford to purchase the property, renovate it and furnish it with our limited budget? We were lucky to have been introduced to Joris van Grinsven, a Dutch interior designer who lived locally. He and his builders came up with a quote for the work that just fitted into our budget. So having never done a project like this before, we bought Le Mas and when the building permission was granted two weeks later, the builders moved in. We sold our flat in Amsterdam, filled a van with our stuff and found ourselves living in France. FE: Did it all go to plan? 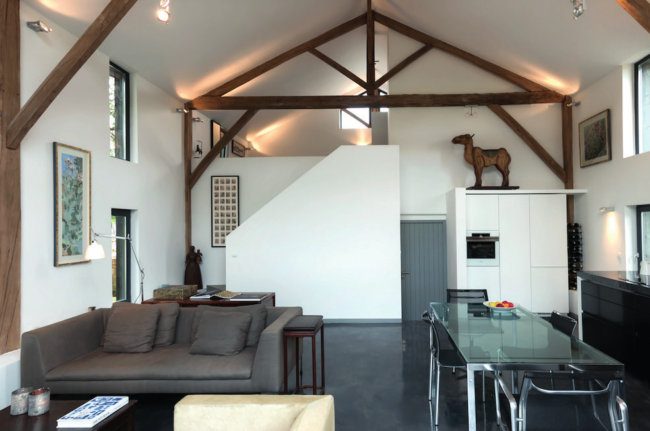 RS: We lived on site during the eight months it took for us, Joris and his builders to transform the place – on time and within budget. Every room was tackled, we landscaped the garden and started marketing the gîtes, even though they weren’t finished. We had moved from a flat in Amsterdam where the bed came out of the wall in the sitting room, to a property with eight bedrooms, eight bathrooms, four wood burners, three kitchens and a swimming pool. Our budget included over 3,000 items that we had to source to furnish the houses: everything from bedding to cutlery to sun loungers. Joris was brilliant in advising on the main bits of furniture (hotel beds, big comfy sofas with washable covers and so on). The rest we purchased throughout Europe, wherever it was cheapest, rather than buying everything in France – which saved us tens of thousands of euros. In June 2016, we opened for business. FE: What has been your biggest challenge? RS: Finding the right property to buy in order to create a successful gîte business and home. We had a clear idea of what we wanted, but it seemed however that the asking price hardly ever corresponded to the market value of a property, but was usually based on how much vendors had spent on it or what they might have got for it when the market was buoyant. We sometimes heard of buyers negotiating up to 40 per cent off asking prices, which made us question whether to view properties over our budget or not. It made house-hunting harder than it should have been. When we bought, we only negotiated on the price slightly, because we felt the asking price was fair. The vendors included a lot of furniture and garden machinery in the sale and offered us and our builders unlimited access to the property before the purchase. FE: Is there anything you’d do differently? RS: In all honesty, no. We are loving our life in France. We are our own bosses, so our time really is our own. Even when I am dealing with the septic tanks or shovelling tonnes of gravel by hand, I am happy I don’t have to commute any more, or sit through weekly team meetings or do annual appraisals. We had a dream for a new life in France, but the reality has surpassed the dream. Good luck, hard work, and the help and advice of others has led to a successful business, a beautiful home, and great new friends. FE: Was the language barrier an issue? RS: Not in the Dordogne. We bought the property directly from the owners, who were English, which meant not paying commission to an estate agent. We used a small amount of the money we saved to hire a Dutch expert on emigrating to France and setting up a business. He checked all the contracts and planning applications for us. Although Franck’s French is very good, happily our notary and bank manager speak English and our accountant is Dutch. FE: What advice would you give to anyone considering starting a gîte/or any business in France for that matter? RS: Do as much research as possible beforehand. There are many forms of business in France, each has its own rules and regulations, advantages and disadvantages. Choosing the right form is crucial, so get advice from an accountant about what would suit you best. Explore other gîte businesses in your area, look at their rental rates and availability calendars and use them as the basis of your business plan. Join Facebook groups of gîte owners or go to laymyhat.com to follow discussions about advertising, marketing, the running of gîtes and tax issues. There is so much information out there, and the more informed you are, the fewer surprises you’ll have along the way. FE: What has been the highlight so far? RS: Getting to know our guests. We never thought that they would want to spend time with us during their holiday – even though we live on site, we do everything to ensure their privacy. Yet often they invite us over for drinks or dinner, as they have fallen in love with what we have created here and want to know more. We’ve now got to know a range of hugely interesting people from all over the world, and we really look forward to it when they return. 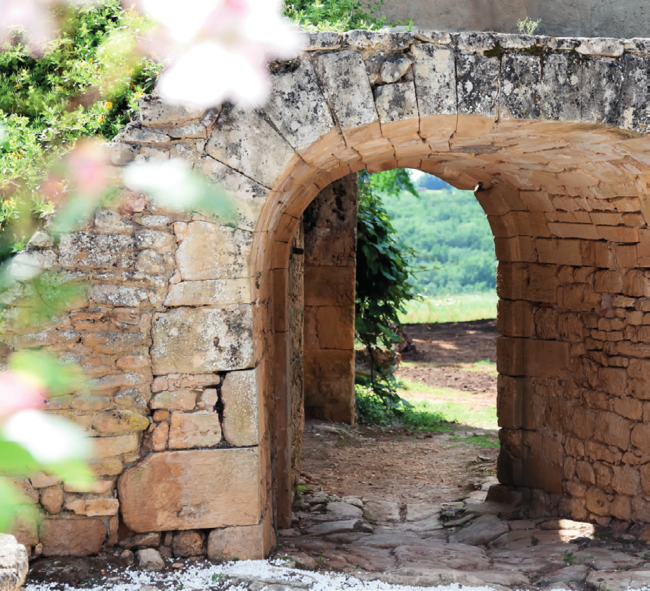 In the heart of south western France, the Dordogne is named after the river flowing through it. 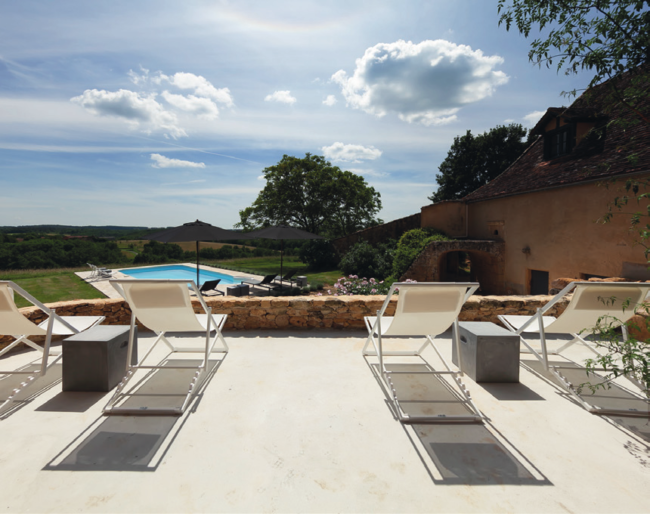 With its glorious landscape, romantic châteaux, bastides and ancient caves containing prehistoric art, it really packs a punch. Try regional specialities duck and truffles and local tipples from popular vineyards such as Montbazillac and Bergerac while you’re here. Transport links are good, with three international airports in the region.